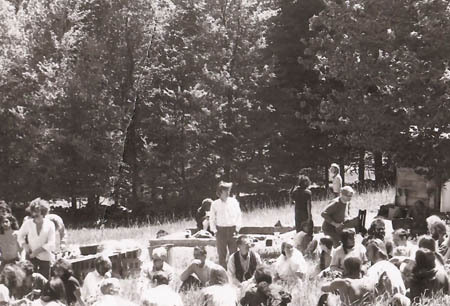 photo courtesy Samuel Kaymen The founding meeting of NOFA, held on June 7, 1971 in Westminster, VT, was organized by Samuel Kaymen. He proposed that the organization would teach 9 principles. by Jack Kittredge based on work and contributions by Grace Gershuny, Liz Henderson, oral histories of various early NOFA leaders compiled by Robert S. Cox at the University of Massachusetts, and personal Emails and records. NOFA has left a dappled history, as have many small and modest organizations. Some individuals, often the ones who speak or write, leave something of a trace. Some activities, again tending to be the ones written about in minutes or newsletters or personal diaries, leave a record. Most people’s memories, however — the excitement, the discoveries, the relationships, the songs and laughter – are too ephemeral and subjective to live on their own. So this will be an attempt to acquaint our newer members with the beginnings of NOFA, and the alliances that helped it get started and grow. You will learn of a few individuals, put together a rough timeline, and hear of some of those early, wishful efforts to live untarnished. But it will be inherently flawed and leave out many important people and events. We still need our Herodotus. NOFA, along with a dozen other organic farming groups, grew out of the unrest among 1960s American youth. Idealistic movements for racial equality, peace and economic justice had encountered strong opposition, with some faltering and turning upon themselves. An unpopular war was proving unwinnable, but our national leaders kept sending new recruits into its maw. Young people, striving to retain their ideals in a society they saw as reeking with cynicism and greed, sought ways to support themselves without compromising. For some, the idea of a rural life, raising food in harmony with the earth, was very attractive. The beginnings of an environmental movement, writings on ‘The Good Life’ by the Nearings, Rachel Carson’s dire warning in ‘Silent Spring’, even the hip advice to ‘drop out’ all encouraged that direction for these decidedly urban and suburban young people — who had no experience of the realities of farming. Some early NOFA leaders are still active, and others have left strong memories. I mention a few here just to give new readers a sampling of the kind of people who formed the association. Born and raised in Brooklyn, NY, Samuel Kaymen was exposed to all the movements and motivations of the 1960s. Feeling that his life was spiritually undernourished, in 1964 he and his wife Louisa dropped out of the dominant mainstream society. After six years searching they found themselves in rural Unity, New Hampshire, and started their first self-sufficient garden. But with his surprise came inspiration. For the next dozen years Kaymen worked to build a self-help organization of like-minded growers who would farm in an organic, natural, and sustainable way. He organized the founding meeting of NOFA in 1971 in Westminster, VT, got a truck and sold local organic produce to day care centers in Harlem, secured a railroad car load of rock phosphate for distribution among members, put together the first NOFA Summer Conference 1975 in Wilton, NH and brought in Wendell Berry to address the 350 attendees, started a farm there at High Mowing School, developed a yogurt business in the garage to support the dairy, and founded Stonyfield Farm Yogurt. One of the growers attracted to Kaymen’s vision and energy was Robert Houriet. Previously a journalist and political activist, he had written a book called Getting Back Together about the country commune movement and with his wife Mary had founded such a commune in Vermont called Frog Run Farm. Becoming a major actor in NOFA, Houriet gradually came to feel that the trucking operation was consuming too much energy and centralizing the group too much for his anarchist leanings. Instead he proposed that NOFA work on a grassroots level — using farmer’s markets as a means of organizing cooperatives — to make the association into a federation of local cooperatives. Both the Vermont Northern Growers Cooperative in East Hardwick and Deep Root Cooperative in Northwestern Massachusetts and Southern Vermont were successful NOFA spin-offs resulting from this effort, growing root crops, largely carrots, with common processing, storage, and marketing. But one developing problem that bothered Robert was that the most successful farmers tended more and more to abandon the coops in order to sell directly to wholesalers — who had become interested in local farm produce — and began competing with each other. Houriet’s efforts, however, resulted in NOFA growth in Vermont (it had previously been strongest in New Hampshire because of Kaymen’s influence). Born in New York City in 1950, the early life of Grace Gershuny took place away from the agricultural epicenter of northern Vermont, where she lives today. Attending Queens College of the City University of New York, she earned a BA in Mass Communications. But by 1973 she, too, was a market gardener in Vermont. In the mid 70s she was recruited by Houriet to set up a farmer’s market in Newport. That led to volunteer work organizing an early organic certification program and becoming Vermont NOFA State Coordinator in 1979. Once the Organic Food Production Act was passed in 1990 the USDA offered Grace a job helping with the drafting of regulations for the National Organic Program. She accepted and became immersed in the world of federal regulatory law for several years. Gershuny went through the trauma of rolling out the initial NOP regulations in 1998 — which were very poorly received — and once the USDA decided to withdraw them helped draft the new regs that went into effect in 2002. Al Johnson came to his interest in farming after getting ill in second grade and changing to a healthier diet. He graduated in environmental education at Boston University and after a stint in the Peace Corps (Solomon Islands) found NOFA in Vermont, taking a job under Gershuny setting up educational on-farm workshops and the first winter conference in 1980. He also was an early certification inspector when NOFA was running the program, before the NOP. Al eventually settled in New Jersey, helping start the NOFA chapter there and serving on the board for many years. A pioneer in organic agriculture in New England, Bill Duesing graduated from Yale University in 1964 and worked as a Cooperative Extension agent before turning to organic principles in the early 1970s. In 1971 he found land near Oxford, CT and started attending early organic farming meetings in Vermont, including the first NOFA Summer Conference at High Mowing (1975) in Wilton, NH. He has said that in the 70s the conventional establishment was not helping those who wished to grow organically and they had to start NOFA as a self-help group. Duesing was also interested in the antinuclear movement and in promoting solar energy. In fact, Connecticut NOFA started as an outgrowth of his work as an extension agent promoting solar energy and energy saving. In 1990 an organic landscape workshop at the summer conference got a number of landscapers interested in learning organic approaches as alternatives to the use of pesticides. Eventually this resulted in the Organic Land Care Program, which developed standards for accreditation and then a five-day training course in 2001. This program was hosted at the CT NOFA chapter, of which Bill was executive director. Another early member who came to NOFA through the back-to-the-land movement in 1970 was New York’s Steve Gilman. A market gardener seeking to make his living from the land without chemicals because of their impact on food and the environment, he avidly sought information from whatever sources were available: Rodale, the Nearings, Cooperative Extension, and focused on building farmers markets. By 1976 he had what he would call a farm and had linked up with NOFA figures such as Kaymen and Houriet, and would later be helpful in building the NY NOFA chapter. A farmer, activist, and writer, Elizabeth Henderson has played a strong role in NOFA since the 1970s. Although a city kid, she discovered rural America as a teenager at summer work camps and loved the experience. After completing a doctorate at Yale on the Russian poet Vladimir Mayakovsky in 1974, she took a job at Boston University as a professor of Russian literature and culture. The sudden death of her husband in an auto accident, however, plus her distaste for academic hierarchy, changed her career plans. In 1979 she and a group of friends purchased 65 acres in Gill, Massachusetts, built a house, barn and greenhouse there, and began cultivating the land. She formed an organic certification committee for local farmers and helped organize a Massachusetts chapter of NOFA in 1982, of which she was the first president. In 1988, however, she moved to New York and began farming first on Rose Valley Farm and later on Peacework Organic Farm. In both cases she established CSAs, a marketing innovation which had been successfully tried earlier in Germany and Japan. Henderson has served actively in NOFA-NY on the board, on the Interstate Council, and as a founder and NOFA emissary to fraternal groups such as the Agricultural Justice Project. The earliest activities of NOFA were those necessary to help the members survive as farmers. Perhaps their most fundamental need was learning about how to practice this new and strange trade. Coming largely from an academic background, members were used to seeking information from established authorities such as governments and universities. But these were the very institutions that were peddling chemical agriculture – what NOFA members wanted to avoid! What to do? They had to educate themselves. Thus the search into older writers such as Hyams and the Nearings, the formation of, first, informal study groups, then on-farm workshops and, later, major activities like an annual summer conference and schools like High Mowing, and the establishment of publications such as The Natural Farmer. Older traditions of thought were helpful in this process. Biodynamic (BD) farming offered many similarities to the organic approach, and NOFA members sought out allies among BD farmers from whom to learn. Early NOFA meetings were often on such farms, such as at Wilton, and the early summer conferences were co-sponsored by the BD Association. Permaculture was also highly regarded, with Tasmanian ecologist and Permaculture originator Bill Mollison occasionally showing up at Wilton to give workshops, along with McGill University soil ecologist Stuart Hill. But NOFA also sought out information from practitioners of cutting edge thinking experimenting with new materials, varieties, and technologies. The work on greenhouse growing, aquaculture and alternative energy that had recently taken place at the nearby New Alchemy Institute on Cape Cod, particularly, was read and studied by many early NOFA farmers. Co-founders John and Nancy Jack Todd were among the Wilton guests who gave occasional workshops. Anarchist theories shaped some early organizational efforts in NOFA. Just as in the recent “occupy” movement, officials and hierarchical structures were suspect as standing in the way of true democracy. Decentralization was a goal. Anarchist Murray Bookchin was a popular early speaker at NOFA events and both Robert Houriet and Grace Gershuny mention being influenced by his talks and writings. In flyers and posters announcing the 1971 foundational meeting of NOFA, Samuel Kaymen had listed 9 skills that the organization would teach. They included such topics as proper composting, seeding, weeding and other aspects of farm production. Conspicuously missing from the list, however, was marketing. “This shows how naive I really was,” Kaymen later said (1998). Without marketing, of course, even the best farming techniques would not bring early NOFA growers the farm viability that eluded so many of them. So the organization set up trucking operations to get produce to markets like New York, organized farmers markets to sell product locally, made close connections with the newly burgeoning food coops, helped larger growers ally with others to establish farmer coops which could collect, clean and package crops to meet the requirements of wholesalers, and tried to educate members about minimal crop quality standards. 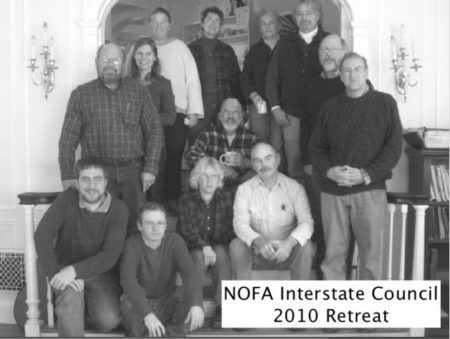 “Early NOFA organizers aimed to distribute produce from organic farmers in Vermont and New Hampshire to activists and food coops in northeastern cities. This entailed costly and time-consuming truck routes to pick up a case of broccoli here and some carrots there, and barely paid the cost of delivery for products of very questionable quality—when payment was even involved. Jake Guest, one of the earliest growers, then based at Wooden Shoe Farm in New Hampshire, tells a story about a load of Chinese cabbage bound for Chinatown in New York City that ends [with the proposed buyer shouting]:, “that not cabbage, that garbage!” It didn’t take too long or too many truck breakdowns to convince the guys (and it was primarily guys at that time) that this was not exactly sustainable. “Despite the prevailing distrust of the profit motive, the more serious growers quickly learned that you can’t make a living growing vegetables— you have to sell them. A change of strategy was clearly called for, and the group quickly adopted a new mission of “local food for local markets.” The focus would now be on revitalizing agriculture and helping the predominantly dairy farmers in our region diversify by initiating farmers markets and wholesale grower cooperatives. Quite a bit of research and analysis went into discussions about the feasibility of eating more locally and seasonally, along with despair over the lack of infrastructure for accomplishing that goal. Although education and marketing assistance were early needs of member farmers, perhaps the most iconic effort of NOFA was to propose and agree upon standards to enshrine organic practices and differentiate them from those of conventional farming, and then to create a mechanism for local groups to verify which farms were in compliance with those standards and grant those farms a certificate that their owners could use to demonstrate to customers that the farm’s claim to be organic was in fact based on more than self promotion. By 1977 organic certification was a focus of NOFA in Vermont and New Hampshire both. As new chapters came into being in New York, Massachusetts and Connecticut in the early 1980s, certification was one of the first programs they undertook. The same general phenomenon was happening with young people ‘returning to the land’ and setting up organic standards and certification elsewhere around the country, of course. A 1980 National Center for Appropriate Technology (NCAT) survey found 17 organic certification programs in as many states, including a couple by distributors and manufacturers for their farmer vendors. Three states, California, Oregon and Maine, actually had organic labeling laws on the books. All these programs had a consistent set of basic organic principles since they all took the IFOAM Basic Standards as their starting point, but they exhibited a range of acceptable practices and divergent verification procedures. The usual certification mechanism was a list of standards that had been agreed upon by a farmer-led committee and approved by the overall organization, an application procedure for farms (including basic information such as a map, field histories, and soil test results), an inspector (usually an experienced farmer) who would make a farm visit, walking the fields and talking with the farmer while poking his or her nose into barns, sheds, greenhouses and equipment, an application fee to cover the expenses of the inspection, an administrator to keep the whole process on schedule, and a committee (sometimes the standards committee, sometime a different one) to evaluate the application information and inspector’s report and make a final decision on whether an annual certificate for a specific farm would be issued. The committees were voluntary, as were the administrators at first (increasingly they required compensation). The inspectors usually had to be paid for their time and travel. There was a constant comparison of standards between the different certification programs — which were inherent allies in needing to keep standards, paperwork and fees reasonable to farmers while assuring consumers that the label meant something. At first only a trickle of growers sought certification. They were selling their products locally, to people who either were not concerned about their growing methods or were happy to buy direct from a producer they trusted. Occasional stories of fraudulent organic claims were not enough of a motivation to most farmers to go to the expense and hassle of certification. As the organic market grew, however, and particularly as stores and distributors became important players, third-party verification increasingly was required to make a sale. Certainly the most intense period of activity involving NOFA in alliances was the period of 1989 and 1990 during which the Organic Foods Production Act (OFPA) was drafted and presented to Congress. In early 1989 the CBS news program ’60 Minutes’ ran a segment produced by the National Resources Defense Council on Alar, a ripening agent applied to apples that had been found to be carcinogenic. The public response was immediate anger, with apple sales nose-diving and parents dumping jars of juice down the drain. This storm of public concern fit perfectly with the growing consumer demand for organic food and encouraged Senator Patrick Leahy in his effort to give “organic” a legal federal definition and create a USDA label for such food. Organic farming groups, needing to confer on this pending development, organized an unusual national meeting in Leavenworth, Kansas in December of 1989. 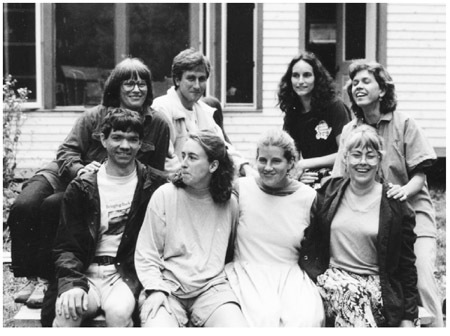 The Organic Food Production Association of North America (OFPANA), organized in 1985, helped get representatives from across the country to come and many, who had been reading about each other for years in newsletters, met for the first time. Kathleen Merrigan, the Leahy staffer charged with drafting the law, had sent out early versions of the legislation. She came, answered questions, and listened to farmer concerns, changing some aspects of the law on the spot. The groups meeting formed a fledgling Organic Farmers Associations Council (OFAC) with Tom Forster, who had worked on the Oregon Tilth organic program and with Gene Kahn at his Cascadian Farm in Washington State, as sole staffer. 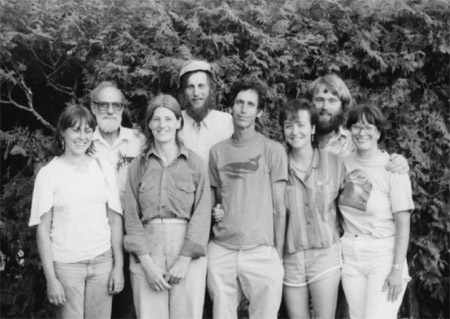 Northeast Organic & Sustainable Farmers Newtork Team — a seven-state project funded by LISA (precursor to SARE), 1989-1990. Of course, the movement was at that point more a vision than a reality, comprising a tiny portion of national food industry dollars. It was simply not on the screens of the major food companies, enabling us to work below their radar and pass mechanisms that seemed to guarantee strong and independent organic standards. It has taken them almost 30 years to roll back those guarantees. During those 30 years, however, organic farmers have also been at work — building a supply of quality food, informing consumers about what to look for, and educating themselves about better and better practices. NOFA has been in the forefront of farmer groups doing this work, widening the circle of support for a good food movement. Many potential allies now present themselves to help us build toward our original vision of living meaningful lives in harmony with the earth. There are of course the consumers, still worried about toxins, carcinogens and other poison and contaminants we put into our food. And there are the environmentalists, concerned about soil, water, air and biodiversity – all things that the industrial food system seems to believe are expendable. We have long counted these folks as our friends, most of the time, for a long time. But the continuing failures of modern corporate agriculture have awakened new allies to whom we need to reach out. Alternative energy proponents have become far more conscious of the role of factory farming in increasing demand for fossil fuels, from use synthesizing fertilizers or petrochemicals to fueling food production, processing and distribution. Smaller farms using fewer chemicals and selling locally can make a big dent in the fossil fuel picture. Decentralized, local food production and marketing also are attractive to those concerned for the values of animal welfare and social justice. Interest in alternative health has skyrocketed over the last generation. Cancer and degenerative diseases of all kinds are growing at epidemic rates. More people now understand that “Let food be thy medicine” is not only good advice but is crucial to our survival. And they know the food being discussed is not processed, fumigated, irradiated, and adulterated. It is food grown simply in healthy soil by traditional methods. And guess who is growing that? Perhaps most encouraging of all these new forces is the expanding scientific understanding about soil carbon’s ability to act as a sink for atmospheric carbon dioxide. It can mitigate climate stresses for a period, giving us a respite to gain control of emissions and bring them to sustainable levels. Farmers are better prepared to sequester carbon than anyone else on the planet. We have the keys to solving many modern problems in our hands, which might surprise (and would certainly please) our early NOFA predecessors. Maybe they weren’t so naïve after all!